Studies have long documented that regular contact with nature allows children to learn and grow better; not only physically and developmentally, but in relation to the natural world. Winnie Palmer Nature Reserve has created their Nature Explore Classroom, Nature Playspaces, to allow children to create positive bonds with nature for long hours of unstructured play in areas including: Messy Materials, Music and Movement, Garden, Dirt Digging, Water, Action, Climbing, Sand, and Gathering. Each space offers a real experience with texture, shape, sound, or life that is found within the “walls” of the Reserve grounds. As visitors turn onto Walzer Way, the Children’s Garden on the right invites little ones to explore the pathways of native perennials and annuals of interest and cover, such as Goat’s Beard, Oxeye, Turtlehead, Christmas Fern, and Switch grass. The garden plants allow children to explore with their senses and sit between the plants. Just beyond the garden’s edge is the Action Area. An interactive Human Sundial allows one to cast their shadow to tell the time of day just as people did in ancient times. Stepping stumps from old pine trees test a child’s balancing skills, and the nature “putt-putt” mini course gives tiny visitors the challenge of hitting a hole in one. Situated under the pines adjacent to the Reserve’s Pollinator, Medicinal, and Vegetable Gardens is the Nature Playscape. It includes a hideaway shelter, tree maze, stump steps, locust balance beam, and swings hung from trees around a circular path. This kinesthetic space allows children to climb, jump, swing and mimic a variety of animal movements. The Nature Art and Music Areas stimulate the senses with a sitting area, water play hole, bird blind, music fence, natural drums, and chimes allowing visitors to explore natural and wildlife sounds and sights. A PA DEP Environmental Education Grant provided funding for nature art tables. Natural objects prompt visitors to create images using these items. Two Nature Art Tables make up the Nature Art Area nestled under the pine trees. Children are guided by Eco-educational cards to create images of various items in nature utilizing natural fallen materials, such as pine cones, twigs, sticks, nuts, and seeds found in the cubby pockets on the nature art tables. Giant tree cookies are found in the Messy Materials Area that encourage children to build sculptures using chunks of cut logs, branches, sticks, stones, and other natural fallen materials. In addition, natural materials and/or salvaged wood building materials were re-purposed to create a bird blind, music ladder, bird houses, or wind chimes. Handmade hypertufa building blocks were created for the Building Area from sand, peat moss, and cement. 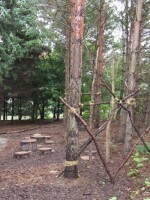 The outdoor classroom was designed with the Reserve’s existing landscape. The newly created pond now controls a spring water run-off issue and serves as an aquatic adventure utilizing large sandstone for tables and mini-docks, and smaller sandstone for sand digging areas. Old locust tree logs and stumps border the Dirt Digging and Messy Material Areas; as well as serve as equipment for the Nature Playground (Climbing Area). With the assistance of the Penn State Master Gardeners who designed the planting areas, more than 50 native plants were added to encourage sensory nature exploration. Native plant choices included Oxeye Sunflower Chelone Glabra, Christmas and Wood Fern, Little Blue Stem, Indian Grass, Meadow Rue, Wild Ginger, and Bishop’s Hat. 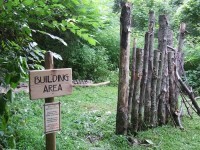 A short walk from the Reserve Learning Center Barn is the Pond Exploration Area. 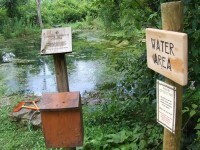 The pond includes an Interactive Discovery Trail box that allows visitors to dip with nets and temporarily view creatures and aquatic plants. A hop, skip, and a jump away from the pond, architectural skills are tested with a fish-shaped sand digging pit, fort building fence, and peat blocks that provide hours of creative construction time. Eco-educational markers prompt visitors to make shelters for certain animal species and dig to find hidden nature items that take them to a different location within the Nature Explore Areas at Winnie Palmer Nature Reserve. This space serves as a home to pill bugs, spiders, millipedes, or maybe even a salamander hanging out under a log in the shade. Binocular look-outs added to the sitting area allow visitors to view hidden images within the forest area while learning the techniques of using binoculars to view birds and other wildlife. Creative names were given to each of the areas such as: Sculpting Scavenger, Outdoor Rhythm, Garden Sprouts, Earth Mover, Aqua Detective, Outdoor Adventurer, Animal Acrobat, Treasure Digger, Nature’s Classroom, Nature Architect and Nature Artist. Each of the areas is defined with a Nature Explore Classroom sign and below each of these is a directional sign that prompts visitors to explore and adventure in each of these spaces. 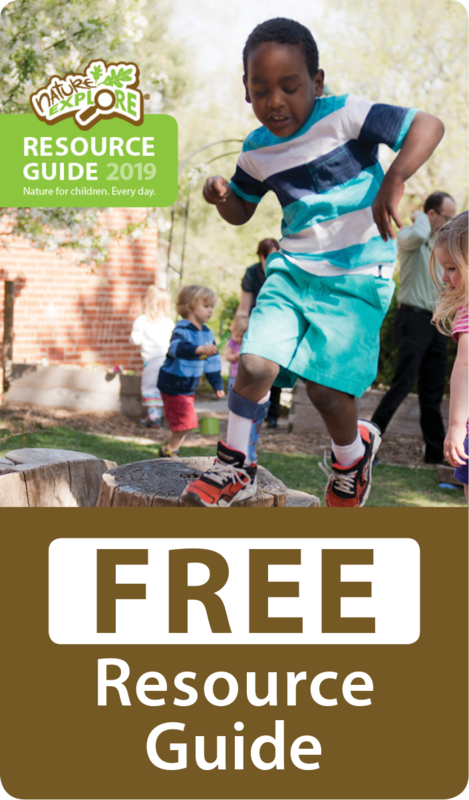 The entire Children’s Garden Area is fenced in via a split-rail fence, tall grasses and trees, allowing children to safely and freely play within the walls of nature while grown-ups either play with them or sit upon a picnic table or log benches. A canopy of tall, old growth pines and maple trees provide natural fencing and a safe haven and refuge from the sun. The Reserve’s Learning Center Barn provides tiny hands a safe place to play with families while offering a cool and dry place if needed if the weather turns quickly. The nature playscape areas were created using natural materials such as locust and sandstone for longevity. Plant varieties are native to Pennsylvania and require minimal watering and fertilizing each year. Designs, such as the human sundial, require minimal mowing and lawn care during the growing season. 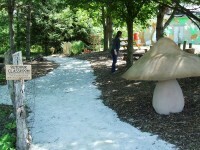 Pathways were created using hard-packed limestone dust that requires minimal year-to year maintenance. The Pond algae and water weeds will be managed year to year biologically with carp, eliminating the need for chemical treatment. WPNR has maximized beauty and visual clarity in the overall design of the space while enhancing habitat for the flora and fauna of southwestern Pennsylvania. Native plant varieties chosen in the design encourage habitat for insects, birds, and other small mammals to the space. Elements such as birdhouses, created from old logs, encourage bluebirds and other cavity nesting birds to utilize the Nature Explore Area. 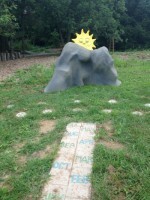 Local artists created sculptures of a life-size mushroom for climbing and a sun that draws attention to the sun dial. In addition, an old potting shed/greenhouse from the original farm is painted with a mural that is four sides: the front reads Explore Nature, the side next to Children’s Garden depicts children playing in nature; another side illustrates pollinators in the gardens, and the final side is painted with native bird species. The old shed doors are painted with chalkboard paint inviting visitors to share sightings, thoughts, and artwork. The Winnie Palmer Nature Reserve is a project of the community and the visitors of the Reserve. The original designs of the gardens were created by a graduate student in Environmental Science Education at Saint Vincent College. Additional designs were enhanced by Reserve staff and interns. 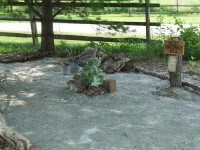 Many of the elements in each of the areas were Eagle Scout Projects. Local Eagle Scouts created, developed and constructed: the Climbing Area that includes swings, a tree maze, stump steps, and Lean to Shelter; the bird blind, journaling wall, and log benches within the Children’s Garden; the fish-shaped sand pit, construction wall, and building block pit along with the outdoor classroom seating; and the log bench seating that surrounds the pond area. Many of the unique features that personalize the nature playspaces at Winnie Palmer Nature Reserve are the creative ideas from student interns, such as the music ladder (Music Area) and nature “putt putt” golf area (Arnold Palmer) within the Action Area. Penn State Master Gardeners have assisted in plant selection and planting for much of the Children’s Garden, along with more than 25 local Rotary Club and AmeriCorps members in weeding, mulching, and clearing in the development of the Nature Explore areas. Nature Explore areas are utilized for program lessons and activities with a Tiny Wonder Program held monthly for children ages 2-5 with an adult. More than 80 children a month spend time exploring in the Nature Explore Classroom. Many “mom groups” meet for play group visits. 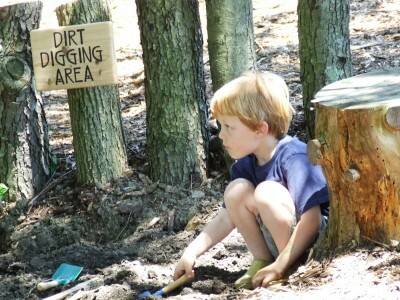 A Nature Explore Area Open House was held in June with students and the community exploring and participating in activities such as dirt digging, nature sculpting, and making music. The Winnie Palmer Nature Reserve is truly a natural place of discovery so that young children, alongside their grown-ups, can investigate, wonder, and test the natural world; all while they learn about themselves and nature.